Today's post comes to you compliments of the fact that I can't actually raise my arms higher than the keyboard. Last week has been a whirlwind of activity including work, showing an out-of-town guest around the city, more work, running after my amazing sister as she did the Chicago Triathlon (to take pictures, of course, no way am I doing THAT anytime soon), and helping move a friend's parents halfway across town. It is not an understatement when I say that everything hurts. For example, did you know that the muscles in your fingers could be sore? I surely didn't. Somewhere in that insanity I had also found time to make two dozen lemon cupcakes for a bridal shower for a friend at work. I hadn't actually had time to go grocery shopping in weeks, so the fact that these cupcakes came out with all my substitutions and tweaks is actually a bit of a miracle, but they came out great, tender and just the right combination of tart and sweet, and were devoured by my coworkers in just a few minutes. 1. Center a rack in the oven to 350F. 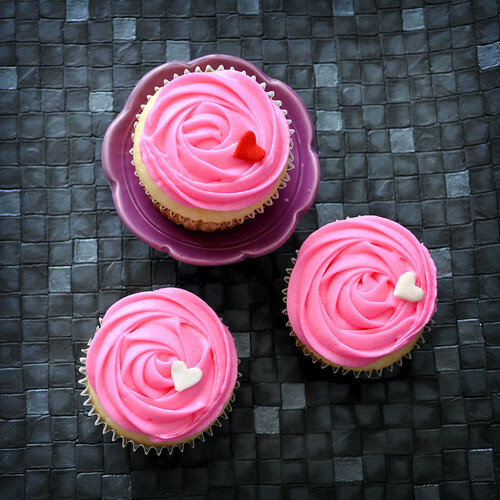 Prepare two cupcake tins by using liners or spray with non-stick cooking spray. 2. Whisk together the flour, baking powder and salt in a medium bowl. 3. Whisk together the milk, lemon juice and egg whites in a separate bowl. 4. Put the sugar and lemon zest in a mixer or another large bowl and thoroughly mash it up with a whisk until the sugar is moist and fragrant. Use the same whisk from steps 2 and 3. No need to dirty more stuff. Add the butter and, working with the paddle attachment, or with a hand mixer, beat at medium speed for a full 3 minutes, until the butter and sugar are very light. It will clump up at first, but will soften and gain volume the more you beat it. 5. Add in the extracts and one third of the flour mixture and beat on medium speed just until combined. Beat in half of the wet mixture, then another third of the dry, the rest of the wet, and finally the remaining dry ingredients until incorporated. I like to stop the machine for each addition and stir the mixture in by hand for a few seconds first to avoid wearing half of it when I turn the machine back on. 6. Finally, give the batter a 30 second beating to ensure that there are no lumps left and scoop/pipe the batter into the cupcake tins, filling each well 2/3 full. 7. 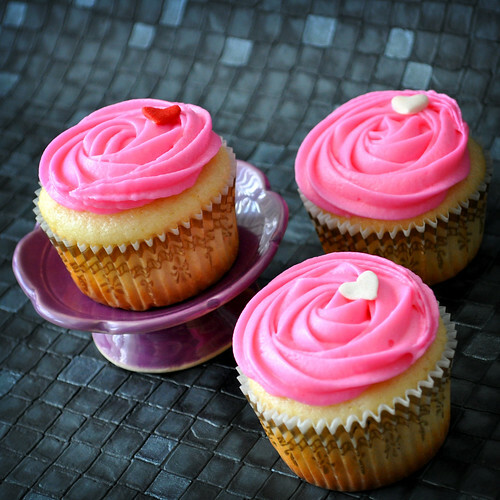 Bake for about 18 minutes, or until a toothpick inserted into the cupcakes comes out clean. Cool on wire rack. 1. Using a mixer, blend the butter and cream cheese together until light and fluffy. 2. Gradually add in the confectioners' sugar until fully incorporated. 3. Mix in vanilla, lemon juice and any food coloring, if using, and beat until smooth. 4. Taste the frosting and add more confectioners' sugar if you like your frosting thicker or sweeter. 5. Spread or pipe onto cooled cupcakes, and enjoy! Note: They keep well in the fridge in a tightly sealed container and taste even better on the second day. So adorable! Pink AND heart sprinkles, of course I love these :) They sound delicious! This is really beautiful color! 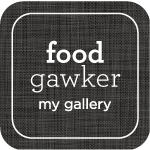 Saw your photo on FoodGawker.com and clicked over to your blog. You do the reverse swirl too! It's my favourite for esthetics as well as for maintaining the perfect cupcake:icing ratio for every bite. The little hearts are adorable too.